The legendary Dungeons & Dragons universe has never really had the game to stand tall in its legacy. While the more popular brand, Games Workshop, has the Dawn of War games and soon the very tasty looking Warhammer 40K: Space Marine to keep gamers coming back. So it’s about time D&D had another roll of the dice with us. Daggerdale takes the Warcraft route for its XBLA/PSN debut and be warned fellow-console gamers, it’s a bit PC-beardy. The best way to go would have been to try to replicate a slick combat title like last-gen’s Baldur’s Gate: Dark Alliance as this slow style of combat is always going to feel a little stale on consoles. After reading the help menu items before the playing the game you might get worried about it blathering on about dice throws. Don’t, it’s not turn-based, I think they just wanted to excite some old-school fans by mentioning dice. The combat involves pressing A until goblins fall over and carelessly drop their purse. 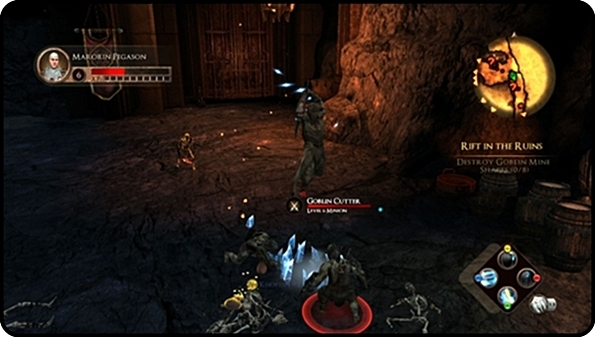 Pressing X will throw whichever weapon you have equipped such as throwing knives or hand-axes. At least you have an infinite number of them. Special moves can be used once, with you having to wait for what seems like forever (a few seconds) while they recharge. You’ll rely on them so much as your regular attacks do very little damage in comparison. Extra special moves take ages to unlock and upgrading existing ones only has a minimal effect. Later levels will unlock attribute points for you to allow specific character tailoring but it doesn’t make the combat any better. The biggest combat culprit though is the blatant lie that is the ‘lock-on’ button. It struggles with standard moves and completely abandons you for the special moves, usually ripping through the thing air behind you, turning you around for a good old-fashioned goblin sword enema. There are your usual fantasy characters to play as: a human with a sword, an elf with a bow, a dwarf with an axe and healing powers, and a halfling with a staff and mystical abilities. Combat essentially feels the same with all of them though. You’re either hitting things up close or blasting something from a distance. It doesn’t matter, the disappointment you get from how small the damage-indicator numbers are remains permanently disheartening. Quests are handed out by generic grumbling characters that aren’t voiced, but make an ugly gagged simlish noise instead. The quests are the usual go there, kill that, bring me this and so on. If you’re playing on your own the difficulty curve is harsh and the checkpoints miserably sparse. Die during a quest and you’ll be sent back to the nearest town or village with an XP penalty, but at least your items remain intact. You will have to restart the whole quest though, despite there are obvious areas checkpoints could have been added, after finding one of two items for example. After grinding away through the first few quests and having a thoroughly miserable time, I decided to reach out for some help. With the single-player game being almost unplayable on your own it’s obvious the game was really designed to be multiplayer only. You can play locally or opt to go online with up to three more players. Going online, you can join an existing party or resume your character’s progress in your own game. You might be waiting a while in your own lobby, but if you go ahead and start, other players will come and join you soon enough. It’s worth the effort of going online, as the game is so much easier when there are more of you. If you die, you can be revived (albeit with a tiny amount of health) with a tap of Y from one of your group. It doesn’t cost them anything and takes a second, meaning you can get back into the frantic brawls once again. A well-balanced team will see players of each race and with a range of abilities, none more important than the healers. When you have this, progress is much easier and you can even start to enjoy it. The problems arise when your party isn’t balanced enough, throw in three human characters with similar abilities and quests become hard work without a healer. It doesn’t help matters that you all look the same too. Extra weapons can be picked up from smashed barrels and defeated enemies, although you’ll have less time to faff around deciding what to use when your party is waiting. If one of your team activates a quest-giver when you’re in a shop you’re automatically dragged out. Shame you can’t do the same mid-mission when you’re all trying to escape a never-ending goblin horde and your healer is in the shop agonising over which hat to buy while you’re all being butchered. The game is easier though when you’re with allies and you can progress through quests without as many agonising restarts, but it’s just so bloody repetitive as you rip through swarms of fantasy fodder. The game can’t really handle a busy screen either. As well as losing yourself in a crowded mob, the game starts to judder along. There’s horizontal screen-tearing when you’re running around an empty area offline, so it isn’t surprising to see the game buckle under the strain of a few extra ugly sprites. 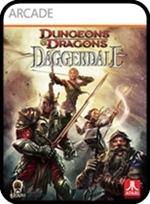 The Short Version: The online functionality saves Daggerdale from being a complete disaster, but the gameplay is ultimately too tedious and the game engine too weak to take the strain when the action heats up. It’s a failed attempt for console gamers. PC gamers should be aware that there are lots of better alternatives, even in the free-to-play range.